With help from the Land O’Lakes Test Kitchens and their tried and true pie recipes, anyone can create a beautiful, homemade pie to provide a traditional sweet finish to their holiday meal. 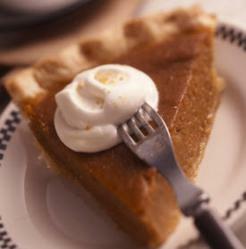 Homemade pumpkin pie with ginger-spiced whipped cream - Thanksgiving dessert never tasted so good! This butter pie crust recipe has only four ingredients and uses a kitchen-tested technique to produce a beautiful pie crust. When it comes to Thanksgiving dinner, there are a few basic components that rarely change. The meal may start with an appetizer, feature side dishes to accompany the Thanksgiving turkey and, on most American holiday tables, there will be pie for dessert. “Pie is one of America’s favorite desserts – especially Classic Pumpkin Pie and Sugar-Crusted Apple Pie,” says Becky Wahlund, director of the Land O’Lakes Test Kitchen. “Many home cooks have a pie recipe for the holidays that’s been handed down over generations.” For those just starting out, easy-to-follow Land O’Lakes recipes for Homemade Sweet Potato Pie, Apple Ginger Pie or even Chocolate Pecan Pie Recipe could be the start of a new tradition. For more great pie recipes, menu ideas, and cooking tips and techniques, visit LandOLakes.com.